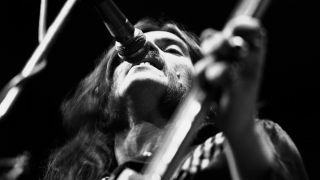 Lemmy’s official cause of death has been confirmed as prostate cancer. The Motorhead frontman died at home in Los Angeles on December 28, two days after being told he had an aggressive form of the cancer. He turned 70 on December 24. TMZ has obtained a copy of Ian Kilmister’s death certificate, which lists “prostate cancer, congestive heart failure and cardiac arrhythmia” as the causes of his passing. Cardiac arrhythmia refers to an irregular heartbeat. Tributes to the late singer and bass player poured in as his death was announced, with manager Todd Singerman saying Lemmy had played through pain in his final year so as not to let his fans down. Singerman said: “To think of the balls it took to still play shows for the fans, to do the last show two weeks ago – and then drop? That’s like a Rocky story to me. Courage at its best. His funeral was broadcast live and featured guest speakers including Slash and Dave Grohl. For further information on prostate cancer, visit the Cancer Research website.